If the Buyer cannot remember their password, they can click on Forgot Password? at the bottom left of the screen. 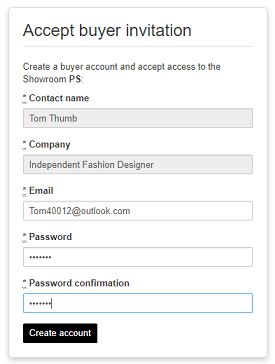 When you invite a customer to your Showroom, they will receive an email message to click on a link to accept the invitation. Alternatively, they can enter an invite code. If they want to enter the invite code, they can click on the "I have an invite code" link located at the center/bottom of the login screen. When, prompted, they will type or paste the code provided to them in their invitation email. The customer will see your brand at the top left corner of their screen and be presented with this "Accept Buyer Invitation" form. As their contact name and company name is already pre-populated for them, they only need to enter their email, password and password confirmation. Then, they click "Create Account". Buyers may receive this message that their email has already been taken. If so, please ask them to click the LOGIN button in the top right corner of their screen. It should allow them to login. 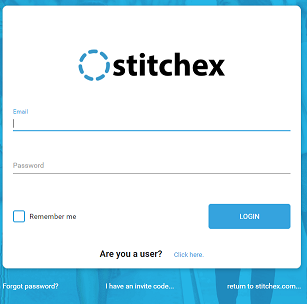 The first time your Buyer's login, they will be presented with ALL Stitchex brands. 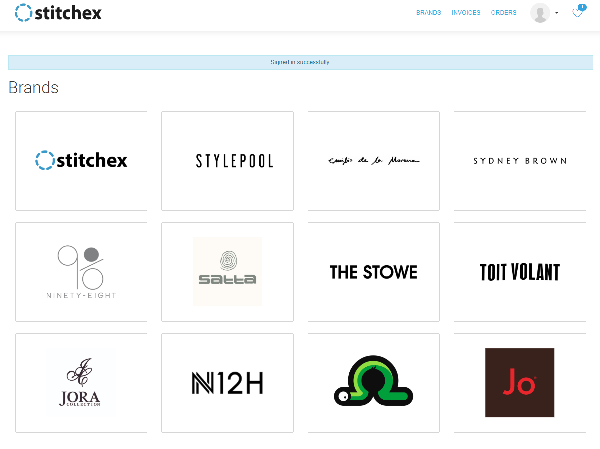 The only ones they have applied and been approved for will display prices and allow them to shop. For more information, see our Buyer Accounts - Sign Up, Apply & Approve Knowledge Article.